Vermont’s New Year’s Eve celebrations often include vibrant fireworks displays. STATEWIDE — The Green Mountain State is host to traditional New Year’s Eve festivals full of fireworks, torchlight parades and fanfare, but there’s also an array of unconventional celebrations…. 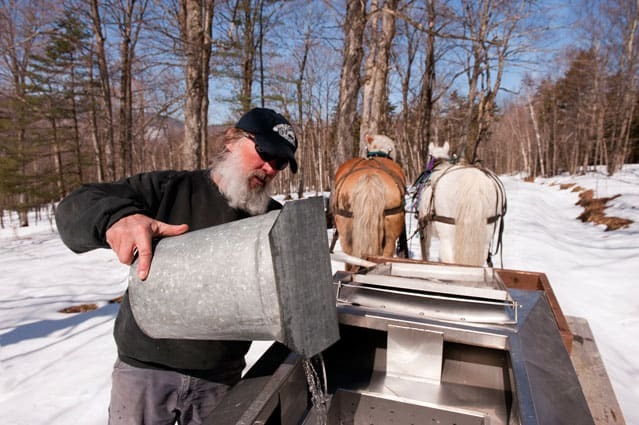 A sugar-maker empties a bucket full of sap into a collection tank, pulled by draft horses. Maple trees are tapped and collecting sap to be boiled into Mother Nature’s sweetest treat — maple syrup. Signs of spring have begun, with longer days, warmer temperatures and maple sap beginning to run. Robert “Ted” Young of Andersonville Maple holds up a morning sampling, ready to savor the sweet flavors of spring. Fresh maple syrup, canned and bottled, sits ready to be enjoyed by sugar lovers.